This text is the hinge on which Mark’s Gospel swings. Previous to this text Mark narrates the kingdom ministry of Jesus as Jesus heralds its coming and enacts its reality through healing, compassion and feedings. Subsequent to this text Mark narrates the passion of Jesus and the events that lead up to his death. In the first half of Mark Jesus is the prophetic embodiment of the kingdom of God among the people. In the second half of Mark Jesus is the suffering servant who gives his life as a ransom for the people. In this swing text Mark introduces a new theme—Jesus begins to talk about his death–and a new mission–Jesus begins his journey to the cross. In the first part (8:27-30), the disciples confess that Jesus is the Messiah (Christ). The Gospel, linked to the first verse of the narrative itself (1:1), identifies Jesus as the hope of Israel, the Messiah. Stumbling their way to faith, the disciples now embrace his Messianic standing. In the second part (8:31-33), Jesus predicts his suffering, death and resurrection. But here we see that though the disciples have embraced his Messianic standing, they have a different Messianic vision than Jesus. Jesus sees it as a way of suffering, they thought it was triumphant. They see, but not clearly as yet. In the third part (8:34-9:1), Jesus announces that discipleship is costly. It is no simple triumphalism but includes loss though it will reap great gain. Discipleship involves a cross before there is a crown. 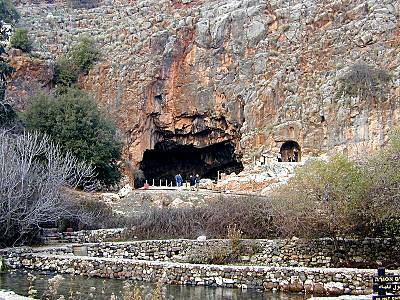 Caesarea Philippi, located about 25 miles north of the Sea of Galilee at the base of Mt. Hermon, was a Gentile region. The city was built near the grotto of the pagan god Pan and Herod the Great built a temple to Augustus there. It was a thoroughly pagan region and a deeply religious place. The Grotto of Pan (pictured here) had been a place for sacrifices to the god Pan since the 200s BCE. It is here—the only time Mark names this place—that Jesus asks his disciples about his identity. The ministry of Jesus had generated widespread speculation about his identity. Herod Antipas had earlier raised the question and was given similar answers as Jesus is here (6:14-16). A resurrected John the Baptist? Elijah who precedes the Messiah? Or, simply another prophet in a long line of prophets? There was no consensus but, it seems, it was believed that God was doing something through Jesus. But Jesus is most interested in what his disciples think. They had, no doubt, pondered this question many times. “Who is this?” they asked, when he calmed the sea (4:41). Now Peter confesses, “You are the Messiah.” It is a bold statement; it is a political statement. It is about the reign of God in the world. God’s appointed king was on the earth. This was a dangerous claim in the context of imperial Roman occupation. Such language was dangerous and many claimants to the title had already been executed in the past couple of generations. His confession is courageous and at the same time Jesus silences him. They should not speak of this because the message is too provocative and the time for Jesus’ public witness as Messiah had not yet come. The messianic secret must still be kept. Immediately, however, we see a contrast between Jesus’s understanding of his messianic mission and Peter’s. Peter sees glory without suffering; perhaps he sees a great military overthrow of Roman oppression and the imminent enthronement of Jesus as king in Jerusalem. If Jesus can command the demons, death and disorder (calming the seas), he can certainly defeat the Romans. Peter’s understanding, however, is Satanic. It is the way of violence rather than self-sacrificing love. The political order—the way of fallen humanity—pursues violent means for peace and justice but God will secure justice and peace through the suffering of the Son of Man. Jesus understands that there can be no glory without suffering. The Son of Man, the eschatological figure who ultimately triumphs over the enemies of God, must first suffer death before he experiences resurrection glory. The reign of God comes through suffering rather than military victory. The cross comes before the crown. Up to this point it appears that Jesus and his disciples were talking privately. This was no public announcement of his death or his Messianic role. He calls the crowd closer. This is probably a group that followed him from Galilee to Caesarea Philippi as he addresses the nature of discipleship. The crowd follows him but do they realize what following him really means? But to follow Jesus—to become a disciple—is to deny yourself and bear a cross. Too often we trivialize this language and tend to think of the “cross” as a symbol of love and reconciliation. But in the language of Roman occupied Palestine it was a symbol of horror, pain and shame. By using the word “cross” Jesus indicates the manner of his own death. It is way false messiahs had previously died at the hands of the Romans. Romans lined the streets with crucified rebels on occasion. Up to this point following Jesus meant free food, good health (healings), safety and freedom from demonic oppression. But Jesus has now turned the tables. Following Jesus now means other-centeredness and a willingness to suffer for the sake of the kingdom of God. They have followed Jesus to “save” their lives (food, health and freedom) but now Jesus calls them to “lose” their lives. Following Jesus means taking up a cross–putting that crossbeam on your back–and dying with Jesus to death. To take up the cross means to follow Jesus to a cross; it means to die with Jesus. To “lose” life is to suffer for the sake of others in the kingdom of God. And yet that is exactly where life is “saved” as well. What is gained is not the “whole world”—serving ourselves to gain status, power and wealth, but what is gained is life in glory alongside the Son of Man in the presence of the Father and his angels. Those who pursue the “whole world” may gain something now but they will lose life with the Son of Man in glory who instead of affirming them will reject them. Jesus wonders about the generation he addresses. When he goes to the cross, will they be ashamed of him? Will the cross deter his followers or will they follow him to the cross? Disciples must count the cost. Following Jesus is costly; it leads to a cross upon which not only our selves are crucified (denied) but it engenders the hostility of those who oppose the reign of God in the world. Jesus assures the crowd that his words are true. His proof is that some of them will actually see the kingdom of God come with power. He may be referring to his resurrection or, as perhaps in Luke 9:27, Pentecost. But the more immediate context seems to be the next event in Mark’s narrative—the transfiguration of Jesus which was an event that evidenced the eschatological power of the kingdom of God (cf. 2 Peter 1:16-18). The transfiguration of Jesus revealed the glory of the Son of Man. The cross will not be the final stop in the Messianic journey of Jesus. On the contrary, the cross leads to glory, just as it does for his disciples. This entry was posted on February 6, 2012 at 7:46 am	and is filed under Theology. Tagged: Christology, Cross, Discipleship, Kingdom of God, Messiah. You can follow any responses to this entry through the RSS 2.0 feed. You can leave a response, or trackback from your own site.